A while back I had to un-deploy an old AD RMS deployment and then deploy a new AD RMS cluster. After deploying the new RMS some of the clients on the network did not have Permission (RMS) under the Options tab within Outlook. I narrowed it down to those clients that used RMS when the old RMS implementation was still in place. There is a way to reset these clients so that they can start over and connect to the new RMS server. 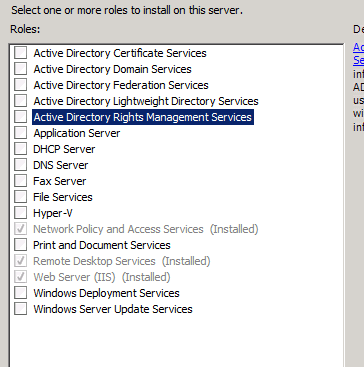 One of the best features of Active Directory in Windows server 2008 is a security tool called Active Directory Rights Management Services (AD RMS). AD RMS allows organizations to secure content such as word documents, excel spread sheets, email’s and even can be integrated in SharePoint. A user would need to be authenticated before they could access the data from any of those content sources. I know this topic has been covered before but I wanted to post the steps from my deployment of AD RMS. A Windows Server 2008 domain is required before you begin. The following roles will need to be added as well. 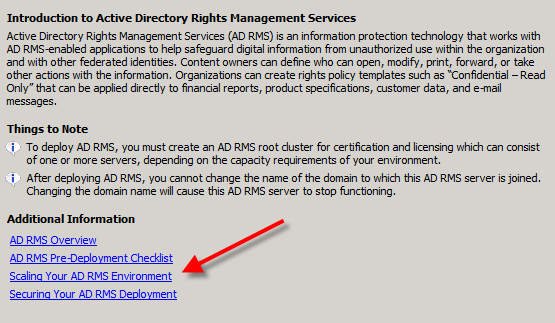 You can explore more about AD RMS on the next window by clicking any of the links. When done click next. There may be a time when an AD RMS install goes bad or you have to remove it for whatever reason. In my case this was deployed by someone else and it needed to be removed because it was not deployed correctly. RMS was not working properly to the point where you could not get into the console. I recently had a need to setup a server that would automatically connect to VPN on Windows startup. On this remote site I did not have a router with VPN tunnel capability. You will need to perform 3 tasks. 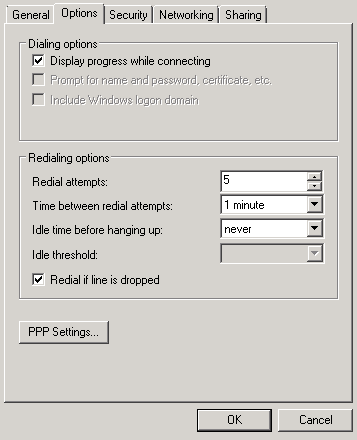 On the VPN connection Options tab set the Redialing options. Select Redial if the line is dropped. This will attempt to reconnect the VPN connection if it detects that it has lost the connection. This is helpful if the internet connection drops and comes back. 2. Create a VPN auto connect batch file. Replace “DOMAINNAME\USERNAME” “PASSWORD” with your own. Save this batch file on your %systemdrive%. When you are done you should have a AUTOVPN.bat file. When I first started working with Exchange I could not find any information that lays out step by step or in an easy to follow format on how to backup and restore mailboxes in Exchange 2007 that have been backed up by Windows backup that comes with Server 2008. I went through the hassle of figuring out these steps. I want to share these 5 steps through this blog post. In this post we are working on Small Business Server 2008 so everything is on the same server. Launch Windows Backup. Click on Recover and restore your Exchange data to an alternate location. Be sure to document the location you restore to. This is going to restore your Exchange .edb and all the log files. The steps in the wizard are below in the form of screen shots.